Google Lionel Messi and almost 60 million results pop up – but the scorecard for amateur footballers, understandably, is a lot lower. That is a balance one high-flying Emirati wants to address with Gold Cleats, a kind of “LinkedIn for football”, which aims to help younger players get spotted online. The website, which is in English and Arabic, was started in 2013 as the brainchild of Saud Al Nowais, commercial attaché for the UAE to the US. 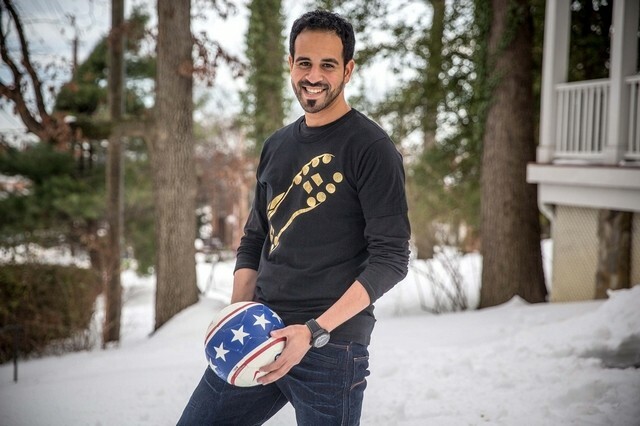 It was inspired by his nephew Khalifa, who wanted him to check out his football skills – something rather difficult since Mr Al Nowais, from Abu Dhabi, is based in the US. He later founded Gold Cleats with five co-founders. It allows young football players to upload a profile and videos of their soccer skills. Talent scouts and agents will eventually be able to browse their profiles and make contact. The website has worldwide ambitions, and last year organised a free football tournament in Egypt, gathering both users and video uploads. The venture is something of a passion for Mr Al Nowais, 31, who started playing the sport in Egypt, where he spent his childhood, and who also played semi-pro for a club in Sharjah. Here he describes his future funding aims for the site, and its broader vision. Why do we need a site like Gold Cleats? There are thousands of websites that give you news about what’s happening in the Premier League, or on the international stage. But there isn’t really a website for amateurs or young players who no one knows anything about. Is it fair to call Gold Cleats the LinkedIn for the football community? Absolutely. We use the term LinkedIn/Instagram of the industry. But with the objective of becoming the Google of soccer. So in future … if you wanted to book a ticket to a game, you’d do it on Gold Cleats. If you wanted to stream old soccer clips, you’d do it on Gold Cleats. That is our major objective. We want to be the home of football. We believe that there is a big platform missing to cater to the amateur market – to high schools, to universities, to unknown academies. Have you ever seen a high school game streamed anywhere? No, it’s not there. And so that’s basic­ally what we want to do. The first is selling advertisements on our site, which we have already activated but are not pursuing heavily. The major revenue streams are going to be subscription-based models, exactly like LinkedIn. The site right now is completely free for everyone, and it’s going to be free for a while. But in the fut­ure, as we introduce new tools to our site, as we allow more players to upload more content and more videos, you will probably have to pay a fee – anything from US$15 to $45 per player per year. At some point we will also charge agents and scouts, teams, clubs, and what we call recruiters, who want to search our database of soccer players. What are your funding plans going forward? During the six-month period up to September 2016, Gold Cleats will aim to raise a Series A round. We are looking at raising anything between $3 million and $6m, to basically hire a full-time chief executive, hire a full-time team, to take this company to the next level. So that’s going to be the most crucial milestone. We need to raise that money and we’re already lining up meetings with venture capital firms here in the US, as well as internationally. What Middle East focus does Gold Cleats have? We do have users from the UAE – we actually have users from 181 countries. However, our focus is going to continue to be on Egypt, next will be Saudi, followed by probably Morocco, Tunisia and Algeria. How many users have signed up to the site – coaches, players and so on? We have over 60,000 users that have signed up to the website. At least 50 per cent of those are active. The site right now is only open to players. We will start inviting agents probably in the second quarter of this year. What is the potential reach of this in the US? Each state has a soccer association. And each soccer association has at least 10,000 to 15,000 players. We’ll probably do a lot of deals with a lot of these associations. And the average household would probably spend around $2,000 to $3,000 a year in trying to help their son or daughter play a sport. I would like to take anything between $50 to $100 out of that, per year, per player. So do the math: the industry is big, it’s huge.